I’m often asked by customers that are new to Systems Thinking, “How can this approach add value to conceptualizing and understanding common, everyday issues?” The issues range from business design to environmental concerns to macroeconomic dynamics. In response to this question, I can tell you from my personal experience, nothing beats seeing a skilled practitioner use our software tools and the Systems Thinking methodology to make sense out of a complex problem. With this in mind, we collaborated with our consulting and training partner, Lexidyne LLC, to create a new series of video-based presentations focused on common but often misunderstood problems that can be conceptualized, expanded, and then explored using Systems Thinking. We recently released the first video in this series — Understanding the Economic Crisis presented by Dr. Mark Paich. Judging from its title, you might think Understanding the Economic Crisis presents a huge complex model of the macro economy. To the contrary, dynamic modeling expert, Mark Paich, begins with a very simple model of something we all can relate to — the individual consumer. Mark expands upon the model and shows how a sudden drop in housing prices affects individual consumption. As you might expect, when Total Net Worth falls, the individual responds by spending less. When housing prices fall, home equity loans no longer provide the purchasing power for big ticket items like cars, vacation homes and big screen TVs. The real surprise however, comes when Mark further expands the individual consumer model to include the economy as a whole. When everyone’s net worth decreases at the same time a phenomena known as the “Paradox of Thrift” occurs. The paradox states that if everyone tries to save money during times of recession, total savings for the overall economy may fall. The dynamics generated by adding elements of the macro economy to the model are indeed surprising. 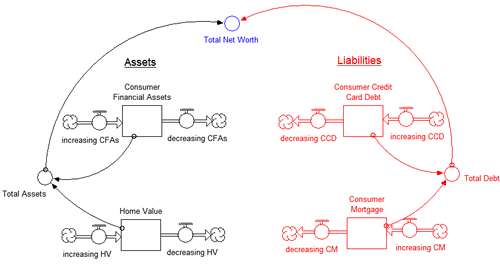 Mark’s easily understood model leads to some real insights concerning the policy implications for an economic recovery. It also provides a great example of how Systems Thinking can be used to deepen your understanding of a complex issue in order to make better decisions. If you haven’t seen the video, I highly recommend it. The following trailer highlights some of the key points in Mark’s presentation and will give you a taste of the full presentation. For more information or to purchase Understanding the Economic crisis, click here.